Create five mobile apps, and explore the world through photography and computer visionAbout This BookEfficiently harness iOS and OpenCV to capture and process high-quality images at high speedDevelop photographic apps and augmented reality apps quickly and easilyDetect, recognize, and morph faces... read more and objectsWho This Book Is ForIf you want to do computational photography and computer vision on Apple's mobile devices, then this book is for you. No previous experience with app development or OpenCV is required. However, basic knowledge of C++ or Objective-C is recommended.What You Will LearnUse Xcode and Interface Builder to develop iOS appsObtain OpenCV's standard modules, and build extra modules from sourceControl all the parameters of the iOS device's cameraCapture, save, and share photos and videosAnalyze colors, shapes, and textures in ordinary and specialized photographsBlend and compare images to create special photographic effects and augmented reality toolsDetect faces and morph facial featuresRecognize collectible coins and grade their conditionIn DetailiOS Application Development with OpenCV 3 enables you to turn your smartphone camera into an advanced tool for photography and computer vision. Using the highly optimized OpenCV library, you will process high-resolution images in real time. You will locate and classify objects, and create models of their geometry. As you develop photo apps and augmented reality apps, you will gain a general understanding of the iOS frameworks and developer tools, plus a deep understanding of the camera and image APIs. 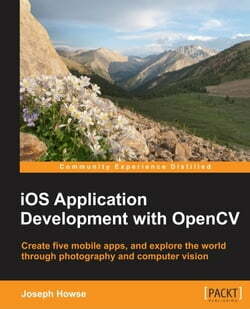 After completing the book's five projects, you will be a well-rounded iOS developer with valuable experience in OpenCV.